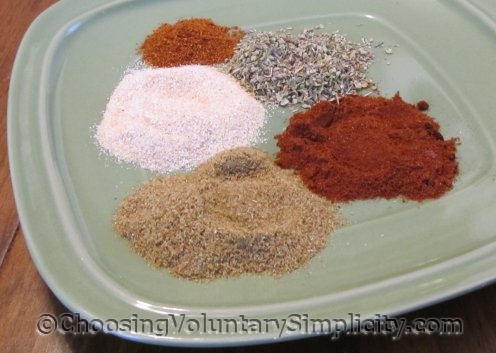 It’s as easy to make chili powder as it is to make the other spice mixes I have written about previously. Most of the commercial chili powders contain anti-caking agents or perhaps fillers… most of them also contain unnecessary salt. This is the version of chili powder that my family likes best. I use much less cayenne pepper than this recipe specifies… usually less than half. I make all of the spice and herbal mixes in small quantities… hopefully only as much as I will need for the dish I am making. For the chili powder, I start with one teaspoon… one teaspoon paprika, one teaspoon oregano, two teaspoons ground cumin, two teaspoons garlic powder, and one half or one quarter teaspoon cayenne pepper. I almost always add more garlic powder to taste.